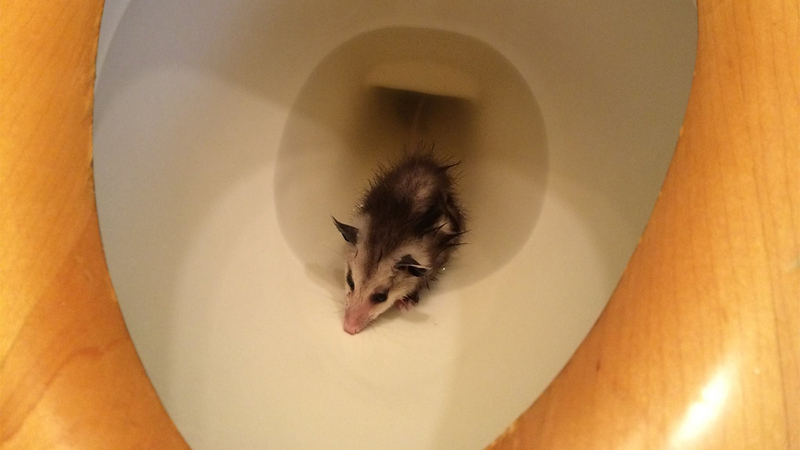 SAN DIEGO, Calif. -- A San Diego woman found a baby opossum in her toilet earlier this month, animal control officers said Monday. County of San Diego Department of Animal Services posted two pictures of the marsupial on Facebook. The animal popped up in the Pacific Beach homeowner's toilet bowl on May 1. The woman, who later found a second opossum in her home, says she found a broken window, which is likely how the animals got inside her residence. Animal Control Officer Carlos Wallis transported the baby opossum to Project Wildlife. The animal is doing well and will be released back into the wild once it's old enough to survive on its own.